Award-winning author Terry Keys takes you on an edge-of-your-seat, high-octane thrill ride for the ages! Buy Death Toll Rising to enjoy this super-powered thrill-ride! This pains me. The story is really good and well executed but it suffers from lack of fact checking and proofreading to earn a 5 star review. That said, if you're not a detail fanatic, you'll probably like it. I received this book from eBook Discovery. This is my honest review, which I voluntarily post here. 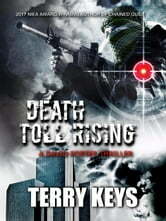 Death Toll Rising by Terry Keys is a hard, action packed page turner that wll keep the reader on the edge of their seat. America is under attack yet again by terrorists, After 2 country leaders are murders at a summit being held in Houston Texas it's up to Det David Porter to again save the day. Well written and a novel that Porter fans will mark down as a "must read". Pulse-pounding international thriller that never lets up. Vivid descriptions put you in the center of the action, and the internal dialogue in the deepest parts of the characters' thoughts and feelings. My favorite part: Keys really hits on how lemming-like the masses can be, and how quickly public opinion can be molded. Well done! I received this book from eBook Discovery. This is my honest review. Didn't really enjoy this book. While I realize it's fiction, and all fiction writers take certain liberties with timelines etc., the details and believability certainly weren't up today the standards of Grisham, Forsyth etc. Also, editing could have been better.